Bee and wasp season is in full swing as summer starts to wind down. To protect you and your family from these buzzing and stinging insects, follow our handy tips! Our home pest technicians were recently called out to a home in Urbandale to find a cicada killer wasp. If you see wasps or a nest around your property and you’re not sure how to take care of it, call a professional to safely remove the pest problem. Preferred Pest Control has special bee and wasp removal techniques and would be happy to help you keep your yard safe and pest free! The cicada killer can grow up to two inches long, making it the largest wasp species found in Iowa. They’re often mistaken for yellow jackets since both wasps have yellow and black striped bodies, however, cicada killer wasps also have a burnt orange or brownish coloring to their wings and parts of their body. Unless provoked, it is very unlikely for these female wasps to sting people. Male cicada killers will try to scare threats away from the nest by flying up close, but they cannot sting. This species is considered a solitary wasp, meaning they do not live together in hives or colonies. Cicada killer wasps dig “nests” for their eggs, and will sometimes burrow up to 24 inches underground. What Do Cicada Killer Wasps Eat? As the name suggests, these wasps prefer to feed on cicadas. Once the female wasp is finished digging nests for her young, her job is to hunt for cicadas or other insects to feed to her larvae. Once she finds her prey, the cicada killer wasp paralyzes the insect with a venomous sting and takes it back to one of her burrows. When the larvae hatch, they will eat the paralyzed cicada before they leave the nest. This particular wasp species can be difficult to detect around the yard since they do not form colonies and their nests are underground. The best thing to look for when trying to detect a cicada killer wasp are the small dirt mounds that form when the female cicada killer wasp is burrowing for a place to keep her larvae. The mounds are usually arranged in a slight curve, and can most often be found in gardens. When you see them around your yard, it’s important to act quickly. If you wait too long,you’ll have a group of cicada killer wasps around your property once the young inside the holes hatch. In this situation, the Urbandale homeowners noticed small dirt mounds around their property. 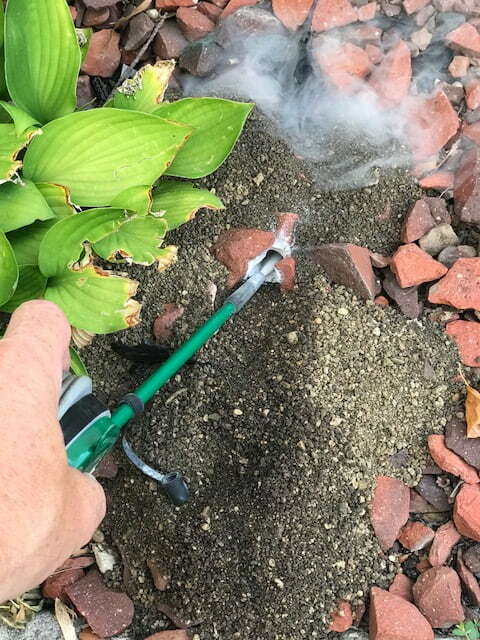 In order to kill the wasps inside and fend off other insects, our wasp exterminator treated the nest with an insecticide dusting tool. This should keep the area safe for about a year. If you think you see a wasp problem near your home, contact a pest control professional to safely remove or treat the nest. Reach out to Preferred Pest Control’s wasp removal experts to take care of the problem and treat the area to prevent future infestations. Schedule an appointment online or call today at (515) 276-7277.